The accord between the German government and energy companies RWE, Vattenfall and Mibrag to put 2.7 GW of lignite-fired power capacity into reserve, will not be enough to wean Germany off lignite, writes Hamburg-based US energy expert Jeffrey Michel. The lignite sector is too well entrenched and lignite mining profitable enough to subsidize the loss-making power production. Only when renewables and gas-fired power generation have fully superseded nuclear capacities and the electricity grid has been expanded, would the end of lignite come into sight. In Germany that is. Lignite, or brown coal, is Europe’s most abundant and least-expensive domestic fuel. Although increased competition from renewable energies prevents many power plants from operating profitably, lignite mining is still profitable. Vattenfall’s possible sale of its eastern German power plants to lignite mining company Mibrag could therefore prolong lignite usage and possibly even restore industry profitability in Germany. In other parts of Europe, the lignite sector seems even less likely to go away any time soon. Burning inferior-grade lignite delivers less energy than hard coal, natural gas, or even firewood. As a result, considerable amounts of the fuel – three times the quantity of regular black coal per Watt – are required for electricity generation. Lignite power stations are consequently the largest individual sources of carbon dioxide, mercury, particulate matter, and other airborne pollutants. As the world’s leading producer, Germany extracted 178 million tonnes (Mt) of lignite from twelve open cast mines in 2014. Together with five times the amount of overburden soil, nearly three million tonnes of earth (equal to the Great Pyramid of Giza in volume) are excavated each day. Besides the destruction of agricultural land and communities, surface mining depletes groundwater levels for decades. Acid runoff from the lignite seams can reduce pH levels in mining lakes to as low as 2 units and contaminate waterways with indelible brown iron hydroxide. The increased availability of alternative sources of energy has made this scale of lignite usage in Europe counterintuitive. Hard coal could be procured at equivalent prices from the world market while preserving local landscape integrity. 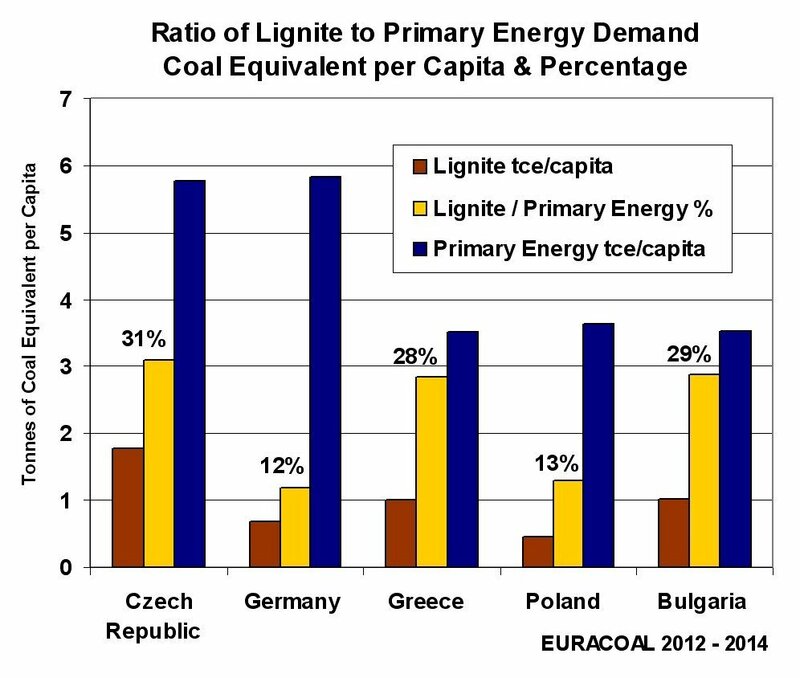 Lignite usage nonetheless remains essential to the energy policies of several EU countries. Greece requires a record six metric tons of lesser quality lignite per inhabitant to satisfy 28% of annual energy demand, more than two times the dependency of Germany (12%). In contrast with solar power and seaborne coal imports, lignite contributes to overcoming the country’s financial crisis with investments in improved efficiency. A €793 million loan has been approved by the German KfW Bank for the new 660 MW Ptolemaida V lignite power plant, with equipment supplied by Mitsubishi Hitachi Power Europe in Germany. Lignite usage is being prolonged in the Czech Republic, which is revoking particular mining limits established in 1991 by Parliamentary Resolution 444. The Bílina surface mine near the city of Litvínov will be expanded to supply the 660 MW Ledvice lignite plant that is entering service in 2016. Supplementary lignite imports had earlier begun from Germany and Poland when the status of mining in North Bohemia still remained unclear. Poland is constructing a new 500 MW lignite power plant at its 1,900 MW Turów mine-mouth site. Europe’s largest lignite power station with a capacity of 5,298 MW is located at Belchatów. The country’s “open cast mines in place” would enable lignite usage to continue until mid-century. In Bulgaria, annual lignite production was increased by 14% to 32.6 Mt by the 660 MW AES Galabovo power plant that began operation in 2011. With the retirement of Germany’s final eight nuclear reactors by the end of 2022, capacity substitution is the primary objective of renewable energy expansion. Less than a tenth of annual power demand is covered by costly natural gas. Domestic lignite and imported coal contribute about 25% and 20% to overall electricity supplies, respectively. Unlike other countries in Europe, Germany provides unrestricted grid access for renewable power production. By 2014, wind (8.3%), solar (5.6%), bioenergy with waste (7.7%), and hydroelectric (3.3%) power accounted for around one fourth of overall grid electricity. These annualized figures are often of little relevance to daily generation, however. Wind power, for instance, fulfilled between 2% and 64% of total grid demand at various times during December 2014. Conventional power plants therefore remained essential to insuring uninterrupted electricity supplies at all times. Renewable energies with a total capacity of 91.8 billion Watts (GW) – including 1.5 million PV solar installations (38.5 GW) and 24,867 wind turbines (38.1 GW) – delivered scarcely more electricity in Germany last year than lignite power plants with 23.1 GW. Whenever this combined fluctuating generation surpasses grid demand, the excess electricity is redispatched to local utilities, pumped storage facilities, and the export market. The added routing costs have been estimated at €500 million for 2015 alone by the grid operator 50Hertz. The construction of additional transmission links from North Sea wind farms for replacing nuclear power in southern Germany has fallen behind schedule. In the recent semi-annual energy transition report issued by McKinsey & Company, only 41 kilometers of new power line capacity had been realized between March and September 2015, just half of the projected distance. Three years of corridor planning have been rendered superfluous by local resistance to high-voltage transmission lines. Alternative underground cables at three to eight times the cost may now be employed, but only over a distance of maximally 80 kilometers to avoid grid disruptions. The north-south link completion date has been set back to 2025. Simultaneous wind and solar generation on blustery sunny days may momentarily render lignite power superfluous. Day-ahead trading prices at the European Energy Exchange (EEX) in Leipzig drop during these intervals below the actual cost of all types of generation. This situation is of no consequence to renewable power suppliers, however, whose 20-year price guarantees under Germany’s EEG feed-in law are paid in direct proportion to delivered grid electricity. However, average revenues from many conventional power plants can no longer cover linear write-downs of investments after fuel and personnel expenses have been deducted. Even though lignite is Europe’s least expensive fuel, that factor alone does not insure profitability. In 2013, Germany’s largest lignite miner RWE (98.6 Mt) already halved its previous €350 million dividends to dozens of Rhineland municipalities and public-entity shareholders. These dwindling returns were partially concealed by management assurances of a “highly cost-efficient and modernised power plant portfolio by 2013/14”. Reduced shareholder distributions, such as the €19 million forfeited by the RWE headquarter city of Essen, also necessitated only moderate readjustments of metropolitan community budgets. By comparison, smaller eastern German communities are facing critical losses. Due to operating deficits at the Vattenfall power block R in Lippendorf south of Leipzig, the municipality of Neukieritzsch will be obliged to refund corporate taxes received in 2014 and partially in 2015. Several million euros are being withdrawn from the budget of this diminutive town (5,828 inhabitants), possibly making its traditional sauerkraut factory a more reliable source of public revenues. Taxes due at other Vattenfall locations are similarly affected, including up to €40 million reportedly being denied counties and communities at the Schwarze Pumpe power station (2 x 800 MW) in Brandenburg. While Vattenfall corporate data are obscured by aggregate accounting, the second generator block S at Lippendorf belongs to a separate company owned by EnBW in Karlsruhe. That corporation’s annual report lucidly reveals the declining revenues of lignite power generation. In service since 1999/2000, the Lippendorf dual-generator (2 x 920 MW) plant provides a respectable electrical efficiency of 41.7% with a net grid capacity of 2 x 875 MW. Local lignite is received directly by conveyor belt from the adjacent Mibrag United Schleenhain mine. Despite these cost-effective prerequisites, however, a net return of precisely “0 €” has been reported by EnBW in every year since 2010. Full equipment write-downs now appear questionable due to lignite costs increasing to nearly €15 per MWh and operating expenses above €8/MWh, while grid wholesale electricity prices have declined by almost half. The Mibrag mining corporation delivered a particularly sobering analysis of lignite power generation at the close of the 2013 business year. The EEX contract price for electricity of 3.96 ct/kWh, it noted, had already fallen to the lowest level since the liberalization of the electricity market. In result, the high capital costs of conventional power generation equipment “could no longer be fully covered”. At Lippendorf, electricity was sold to the grid by EnBW at an average price of 5 cents per kWh in 2012, but for only 3.79 ct/kWh in 2013 and 3.68 ct/kWh the following year. An average price of 3.25 ct/kWh is now predicted for 2015. At increasingly lower revenues, the usual amortization periods of 12 to 33 years assumed for property, buildings, and equipment will be more difficult to attain. However, the main boiler was already written off by EnBW in 2014. By inference, the parallel block R belonging to Vattenfall might now be sold for a fraction of its remaining book value when the company withdraws from the lignite power business. After announcing the intention to sell its eastern German lignite operations in 2014, Sweden’s state energy corporation Vattenfall AB opened the bidding process for four power stations and five mines on September 22, 2015. Mibrag owner EPH and the Czech national energy conglomerate ČEZ are among the takeover contenders. Over the years, more than €9 billion has been invested in power stations at Lippendorf, Jänschwalde, Boxberg, and Schwarze Pumpe. These installations were bought by Vattenfall in 2002 together with hydroelectric plants and transmission lines after the municipal power utilities in Hamburg (HEW) and Berlin (BEWAG) had been acquired. The company asserted in 2013 that the lignite business was highly profitable, but that could especially apply to mining operations. Despite an additional 675 MW plant completed at Boxberg in 2012 for €1 billion, Vattenfall’s entire lignite holdings as well as 10 hydroelectric installations could now be sold for as little as €2 billion. It is unlikely that any investor would take over Vattenfall’s plants and mines just for the purpose of retiring them, particularly since landscape reclamation costs and water pollution liabilities must still be defrayed. At RWE, continuing lignite operations also provide needed revenues for nuclear phase-out and retirement pensions, according to CEO Peter Terium. The mining regions offer little prospect for alternative investments at any scale comparable to the lignite industry. The hypothetical possibility of nationalization might only mummify current infrastructures. The new owner of Vattenfall’s assets could possibly replicate Mibrag’s high mining profit margins on a broader scale. In 2013 alone, this Czech-owned corporation accrued a net return of €82 million from lignite operations in Middle Germany, fully 19.5% of total turnover. Applying this percentage to the 17.4 Mt of lignite sold to customers for €363 million, an effective profit of 4 euros per metric ton was realized. While lignite power generation is increasingly less competitive, mining remains all the more lucrative due to the absence of near-field competition for thermal energy. Power stations are captive customers that can be overcharged for fuel from adjacent mines. With few exceptions such as certain municipal utilities and sugar factories, lignite plants are logistically dedicated to particular suppliers. Lignite is also less expensive at distant locations than natural gas despite lengthy highway or rail transports. After mine-mouth power stations are finally retired, continuing revenues may be realized with just-in-time deliveries of specified lignite grades to municipal and industrial users. Despite unparalleled profitability, German lignite producers are not obliged to pay mining royalties, since their original licenses were issued before the Mining Act of 1980. Municipalities also are deprived of market-value compensation for lost landscapes and destroyed historic villages such as the seven century old Heuersdorf near Neukieritzsch. Generating electricity from lignite typically emits about one kilogram of CO2 per kilowatt-hour, more than twice the amount of gas power plants. Substitution or abandonment would be elemental to achieving future greenhouse gas reduction targets. The sale of Vattenfall’s lignite assets is already connected with low-carbon government policies in Sweden, where likewise no nuclear compunctions prevail. Germany’s future CO2 reduction path, by contrast, depends on transmission corridors connecting renewable power installations with widely scattered points of demand. Few possibilities have been developed for flanking this effort. The federal coalition government’s 25% target for local power cogeneration in 2020 languishes at two thirds that figure. Smart metering and intelligent households are mistrusted as gateways for data security breaches. Growing renewable generation redundancies result in frequently oversupplied transmission capacities. Pumped hydroelectric plants can absorb only part of this surplus energy, while grid demand for stored electricity has likewise diminished, Germany’s largest pumped storage facility at Goldisthal, completed in 2004 at a cost of €620 million, has now become part of Vattenfall’s overall hydropower package with an estimated resale value of only one-third that figure. Under these conditions, the lignite industry remains well-positioned to defend existing mining and generation. By recent agreement with the German government, eight particularly inefficient plants (2.7 GW) at RWE, Vattenfall, and Mibrag will now be withdrawn from active service and retired within four to seven years, with costs of €1.6 billion passed on to ratepayers. Only when renewable energies and gas power generation have fully superseded nuclear capacities would the prospect of widespread lignite phase-out become plausible in Germany. One possible future scenario for the lignite sector would see Mibrag buy Vattenfall’s lignite assets. How could this work? Block R of the Lippendorf power station constitutes 11.5% of Vattenfall’s total lignite generation fleet capacity. The final sale price could hover around a quarter million euros, about half the €470.6 million book value listed by EnBW for block S at the end of 2014. Assuming equivalent delivery terms to both blocks, Mibrag provided about 5.1 million tonnes of lignite to block R in 2014 at a price of €92.2 million, realizing a net profit of €20.5 million. By devoting this annual sum to purchasing the block, the installation could be debt-free after 12 years (not including additional outlays and interest). 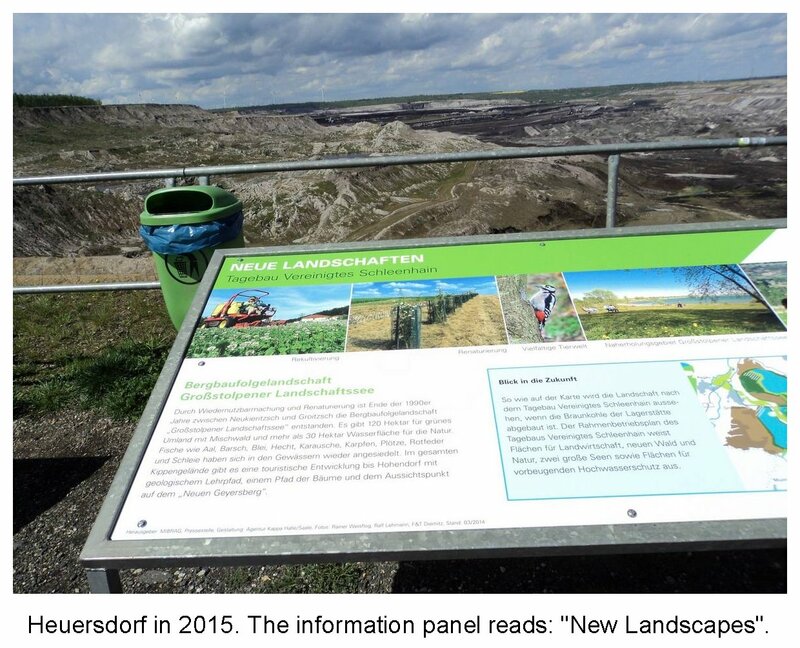 By simply redirecting the estimated 4 euro mark-up it had previously been charging for delivered lignite, therefore, Mibrag could assume full title to Lippendorf block R by around 2030. All regular write-downs would be superfluous, resulting in an annual net profit of €59 million referred to the most recent balance sheet. At the 2014 generation level of 6.2 million MWh, a total profit at Lippendorf of over €79 million appears achievable when existing lignite deliveries to EnBW Block S are added. Mibrag could realize over €34 million additional revenues in consequence. 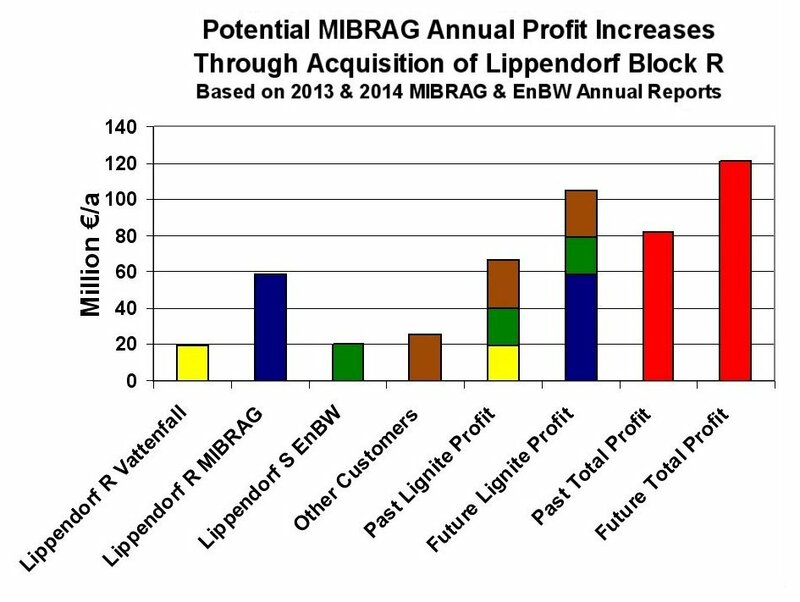 While Mibrag delivered a net 19.5% profit of €82 million in 2013, that figure could jump to around €120 million once Lippendorf block R had been acquired. The company would simultaneously have added 875 MW of generation inventory to its corporate portfolio essentially free of charge. A comparable revision of power plant write-downs might also return lignite-based generation to profitability at Vattenfall and RWE, as well. In that case, the progress of greenhouse gas target fulfilment would have been significantly impeded by bookkeepers at Germany’s major power corporations. See his author archive on Energy Post. I’m surprised that the author does not mention the recent Greenpeace initiative for the Vattenfall plants. It isn’t clear to me whether it is a ‘PR Gag’, as it has been described by some, or an interesting chess move. The study “Vattenfall’s Opportunity” mentioned at the Greenpeace press conference in Berlin on October 20th contains no mention of CEZ, EPH, or the Czech Republic. The same is true of “Vattenfall’s Risky Business” issued a year ago. The Greenpeace initiative is commensurately one-dimensional. It disregards the likely intentions of Czech corporations concerning Lusatia. Annika Jacobson stated in Berlin: “There is a very big risk that lignite operations will be sold to someone who intends to operate the lignite mines for decades to come.” However, Vattenfall’s assets are not being offered for sale to facilitate their early retirement. Until Greenpeace overcomes its contradictory reasoning in this regard, all commentaries on the organization’s current strategies will be only snapshot appraisals. The lower the value ascribed by commissioned studies to Vattenfall’s power plants and mines, the greater the buying opportunity will become for a future owner. Outbidding Greenpeace should not be difficult under that circumstance. Several German newspapers reported on April 8th that the Czech EPH, which already owns MIBRAG, will now be taking over Vattenfall’s eastern German lignite operations. This development eliminates any speculation over the widespread retirement of lignite power plants for achieving CO2 emissions reduction goals. The mounting expenses of mining landscape reclamation can instead only be covered by revenues from long-term lignite generation. No one has ever proposed alternatively dedicating solar or wind farms to meeting this requirement. Although the EU ETS has been ineffectual I wonder what would happen if prices rose to (fantasizing for a moment) to Euro20/Tonne. Given they are around Euro8/T now, this would bolt on Euro12 to a MWh cost – if wholesale prices remain low – this makes lignite stations very very unprofitable (in this scenario). Given that the new Polish gov is unlikely to be receptive to ETS reform (English understatement) nevertheless it seems that consideration of the EU ETS and its possible evolution is missing from the article (which is very very good – otherwise). This inquiry is justified. Adding ETS costs significantly reduces the attainable profitability of fossil fuel power generation. For the grade of lignite employed by the Lippendorf installation, a CO2 certificate price of €8 per tonne equates to about 0.68 cents per net generated kWh. No figures on ETS outlays are given in the annual reports of either EnBW or MIBRAG, rendering any calculation potentially erroneous. However, since the cost of lignite mining lies far below the 17.62 €/t (1.47 cents per kWh) charged to EnBW, the corresponding estimated profit of 4 €/t realized by MIBRAG confirms the business case for selling lignite to customers by long-term contract. At the same time, the Lippendorf operation offsets some of its expenditures by delivering warm water to the city of Leipzig for district heating. If you look at Germany’s current electricity supply, you’ll see that nuclear and browncoal are totally inflexible. The flexiblity needed for complenting renewable electricity output is supplied mostly by hard coal and then by gas. So after nuclear has gone, browncoal has to go next from a systemic point of view. The fossil fuel industry cannot be easily eclipsed as long as existing infrastructures provide opportunities for further innovation. 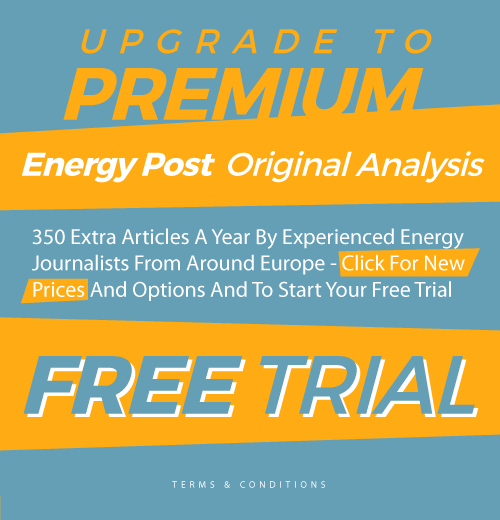 The article “The Flexibility of German Coal-Fired Power Plants Amid Increased Renewables” at Cornerstone Magazine of Winter 2014 illustrates how coal and lignite power plants have been coping with the varying grid penetration of renewable energies. Since the original German-language article appeared in 2012, particular installations have been retrofitted for even greater flexibility. At the Vattenfall Flex-Gen website, it is claimed that the lignite power stations at Jänschwalde, Boxberg, Lippendorf, and Schwarze Pumpe can reduce their total capacity of 9,000 megawatts by about 50 percent within 20 minutes.